We are a leading Manufacturer and Supplier of designer range of Gold Jewellery, Silver Jewellery, Diamond Jewellery, etc. Besides, we also Trade and Supply wide array of Loose Polki Stones and Loose Diamond Stones. 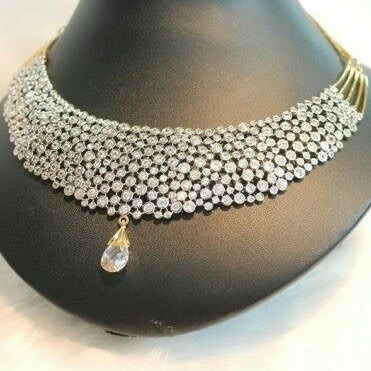 Being a quality driven company, we are actively engaged in Manufacturing and Supplying a beautiful assortment of Gold Jewellery, Silver Jewellery, Diamond Jewellery, etc. The offered range is available in a plethora of elegant designs, patterns and colors. These jewelleries are highly appreciated among our clients for their magnificent shine, trendy design, elegant pattern, charming look smooth polish and excellent finish. Moreover, we also Trade and Supply an optimum quality assortment of Loose Polki Stones and Loose Diamond Stones. Our esteemed clients can avail these jewelleries and stones from us at market-leading prices.